Both Butler's student Newspaper and Magazine were Silver Medalists. 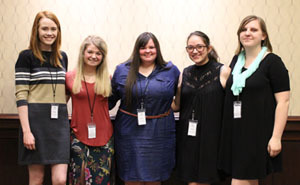 Butler Community College’s Mass Communication Department took home 41 awards from the Kansas Collegiate Media Conference, April 9-10. Butler’s newspaper, Butler Lantern, was named Silver Medalist for the All-Kansas Award for two-year schools and newspapers. The Lantern picked up 22 other awards. The Grizzly, the college’s full-color, high-gloss magazine, received a Silver Medal overall award, in addition to 18 other awards. Butler Lantern students that helped contribute to the overall award are Hayley Smith, Olivia Vest, Hunter Fullhart, Caleb Thornton (Eureka High School), Matt Cooper, Kaitlin Parks (North High School), Victoria Lemon, Tyler Krenzin, Tesla Bethel, Sergio Cisernos, Connor Defletsen, and Jack Clayton (East High School). Grizzly Magazine students that helped contribute to the overall award are Jaycie Wunder, Max McGlaun, Emily Beckman, Tatum Sturdivant, Nadine Armstrong (Council Grove) and Allison Simon (Eureka). Activity scholarships, which cover tuition and books, are available each semester for The Grizzly and The Lantern staff. Members of The Grizzly staff have claimed Journalist of the Year award from the Kansas Associated Collegiate Press for nine of the past ten years.